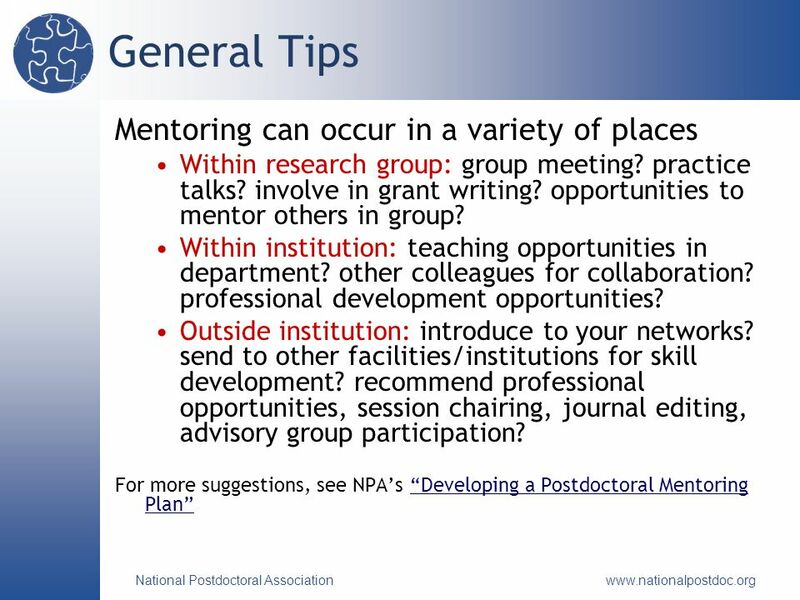 Www.nationalpostdoc.org A Mentoring Toolkit: Tips and Tools for Mentoring Early-Career Researchers Kathleen Flint, PhD January 6, 2010 AAS Winter Meeting. 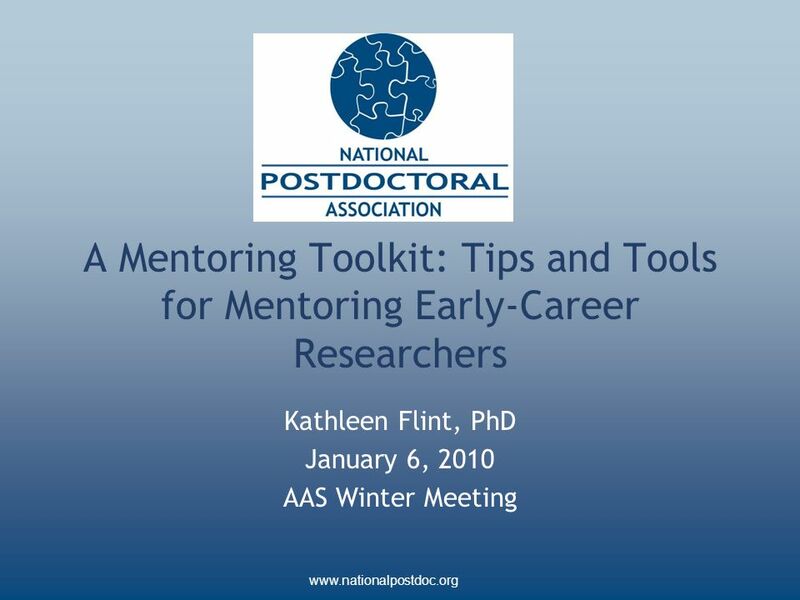 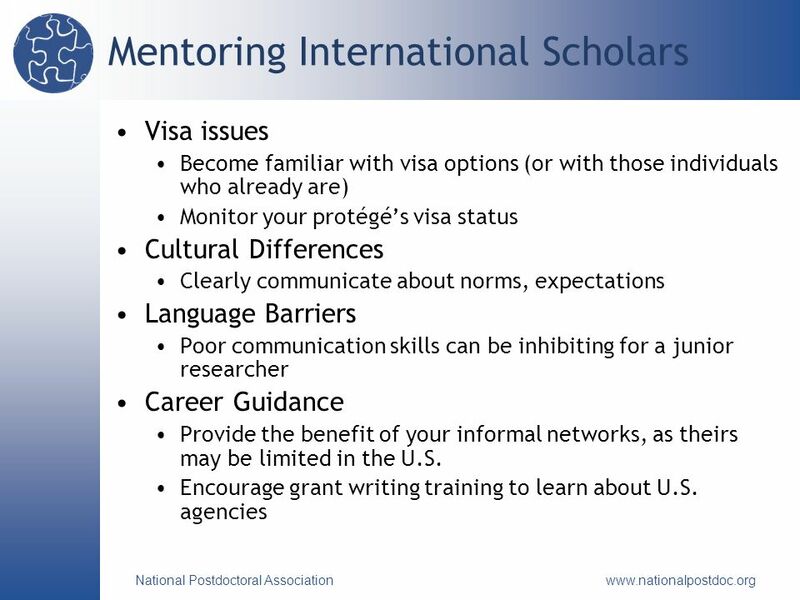 Download ppt "Www.nationalpostdoc.org A Mentoring Toolkit: Tips and Tools for Mentoring Early-Career Researchers Kathleen Flint, PhD January 6, 2010 AAS Winter Meeting." 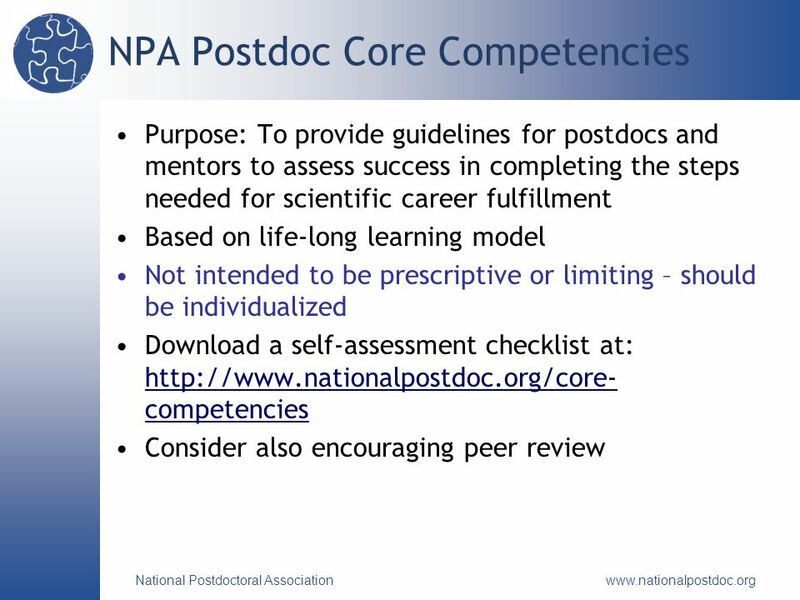 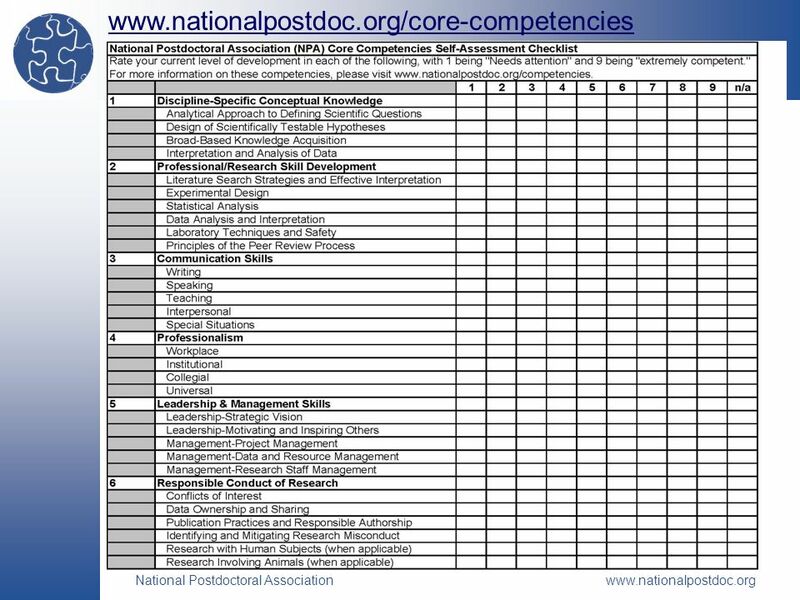 To be or not to be a Postdoc? 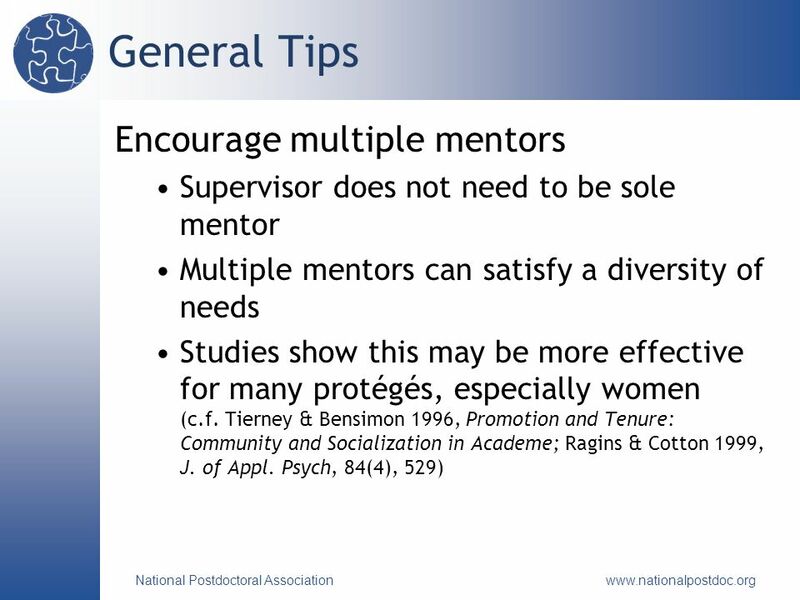 Kathleen H. Berecek, Ph.D., Professor of Physiology and Biophysics, University of Alabama at Birmingham Women in Physiology. 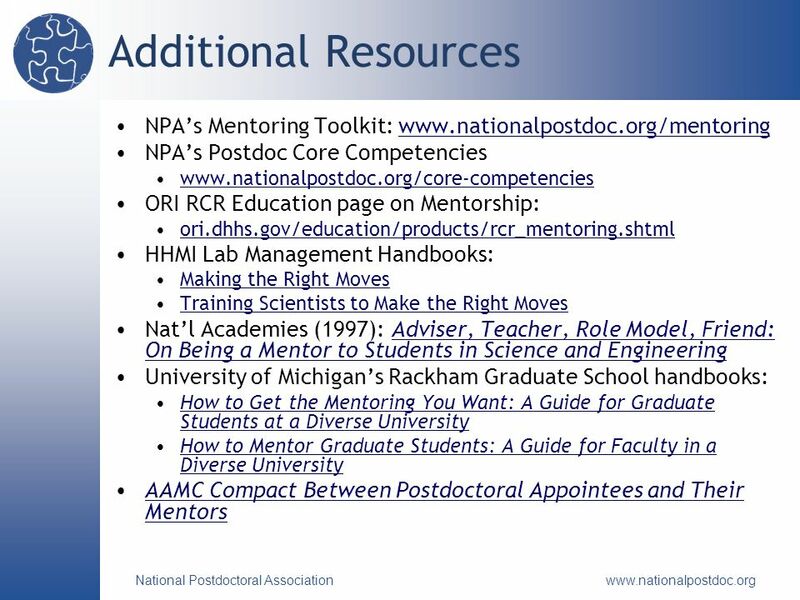 Broadening Participation… The Role of Underrepresented and Underserved Students and Faculty Roosevelt Y. Johnson, Ph.D. 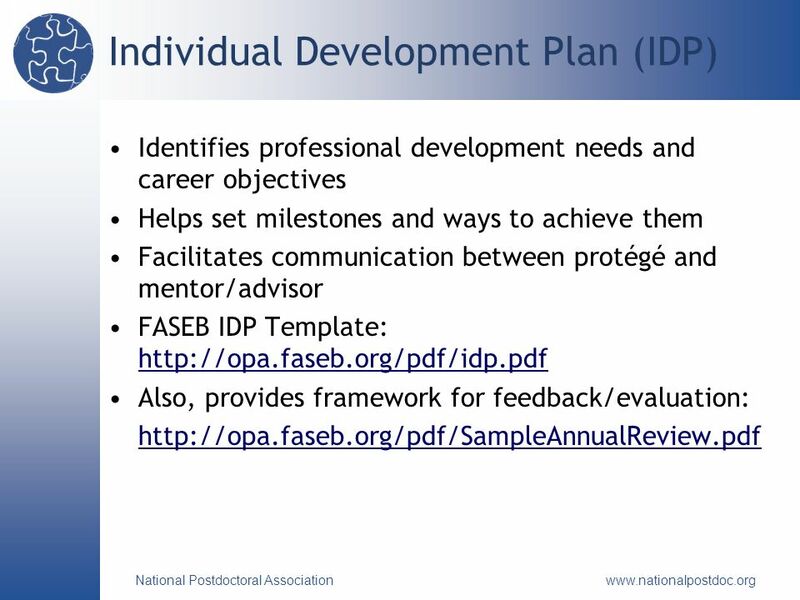 Program Director Division of Research. 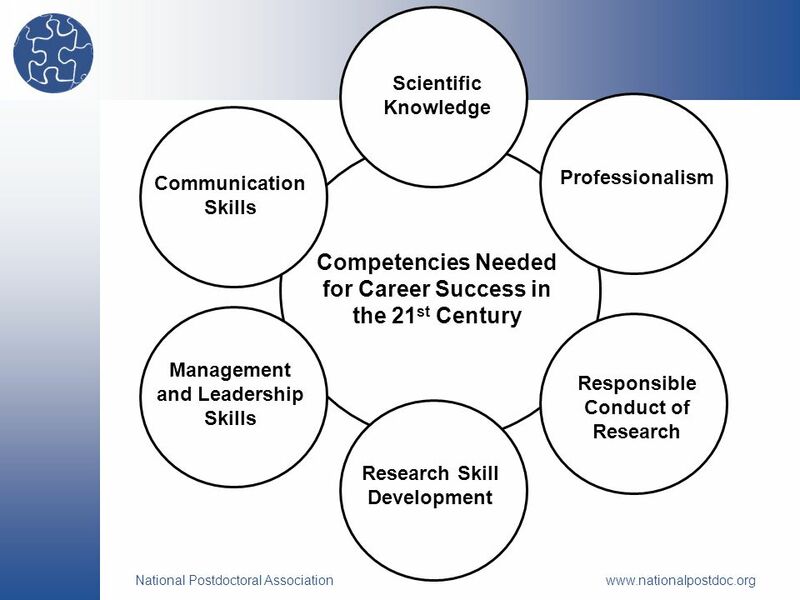 Lois K. Evans, PhD, RN, FAAN vanAmeringen Professor in Nursing Excellence University of Pennsylvania School of Nursing GSA, Boston *** November 20, 2011. 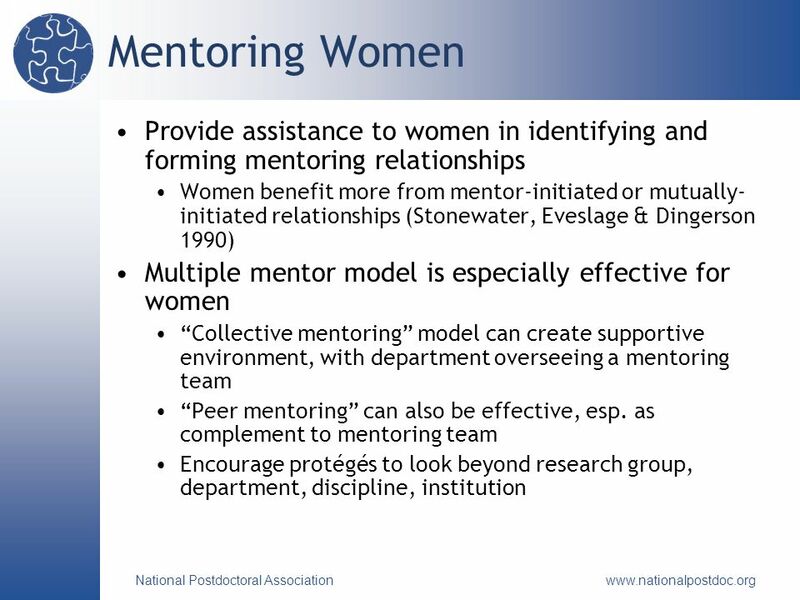 Mentoring 101 AGHE Faculty Development Committee Webinar #1, March 31, 2009 Telemachus and Mentor. 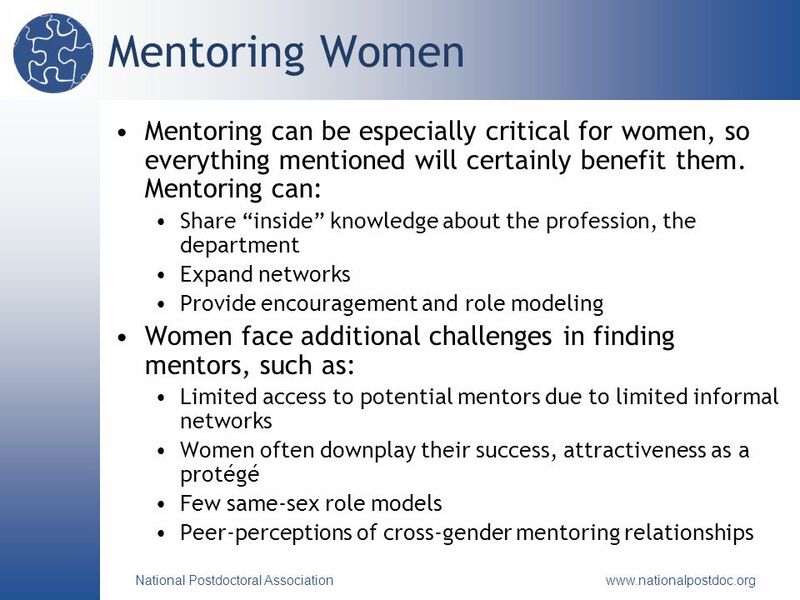 Faculty Mentoring at NYULMC: A Championship Season S CHOOL OF M EDICINE N EW Y ORK U NIVERSITY Georgeann McGuinness, MDNaoko Tanese, PhD Director of Clinical. 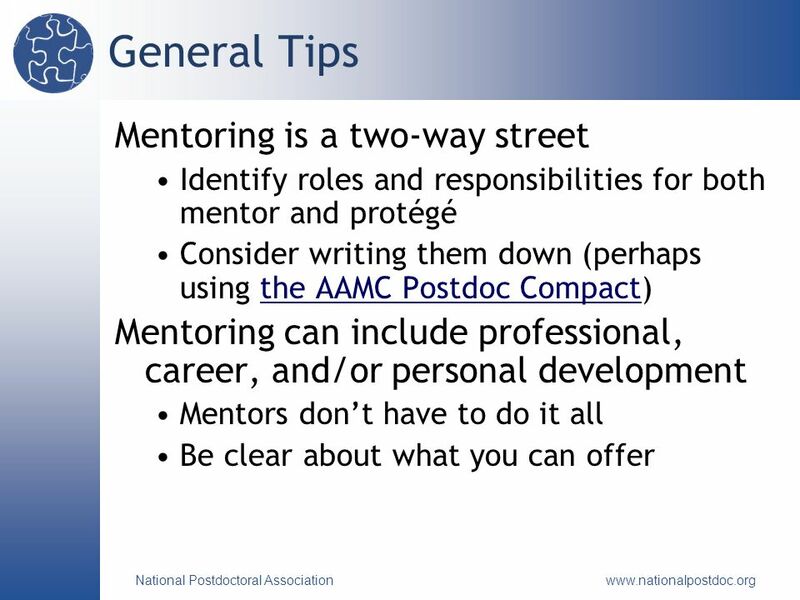 Mentoring 101: (1) How to Find a Mentor (2) How to Be a Mentor Tracy Camp Colorado School of Mines. 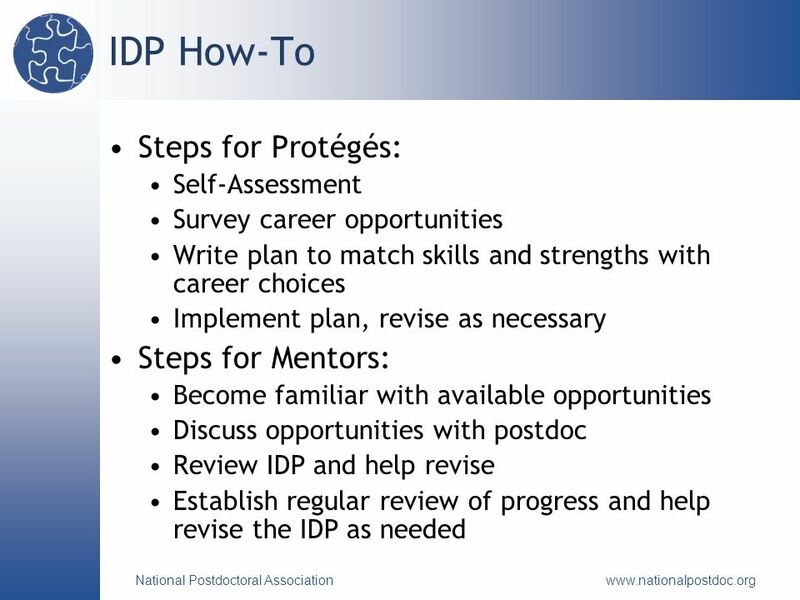 Keys To Success: Unmasking The New Professional Experience Kawanna Leggett Assistant Director of Residential Education The College of New Jersey. 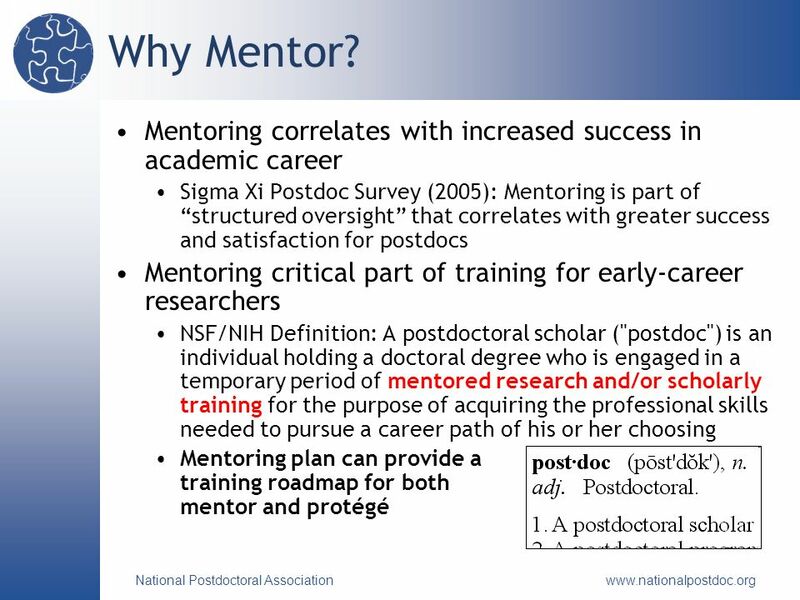 NIH Mentored Career Development Awards (K Series) Part 2 Thomas Mitchell, MPH Department of Epidemiology & Biostatistics University of California San Francisco. 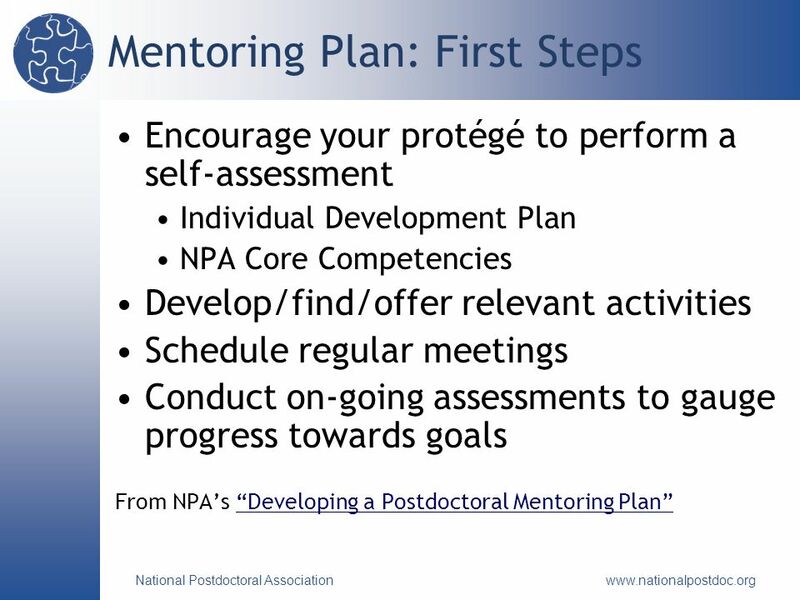 A Path to Academic Success: Promoting Teaching Development of Graduate Students through a Certificate in University Teaching and Learning Suzanne Le-May.